One quarter of Americans have begun or are beginning to work on the second half of their lives. Tapestries was written for all those trying to gracefully move through this rich yet confusing period. The meditations focus on topics that relate to the reader’s passage through this life stage: change, impermanence, transformations, immortality, growth and survival. Tapestries can be creativity used to fit the needs and interests of the reader. Some may want to choose a specific topic, others may want to randomly select a page and still others may choose to start at the beginning and work their way through to the end. Quotations from a variety of authors, time periods and religious traditions are an important part of each reading. Gail Mesplay is a retired high school history teacher. She is spending the second half of her life writing, traveling, and working as a hospice volunteer. She is the author of A Moment of Peace and Quiet: Meditations for Teachers (Smyth & Helwys, 2002). She lives in the Rocky Mountains of Colorado with her husband, Ken. 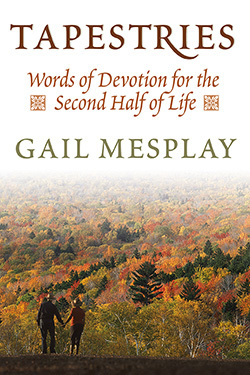 Learn more about Gail Mesplay.